Tulkarem (Palestinian Territories) (AFP) - Israel freed on Friday a 14-year-old Palestinian schoolgirl, whose jailing six weeks ago for planning to attack Israelis became a focus for anger over the arrest of children in the occupied territories. 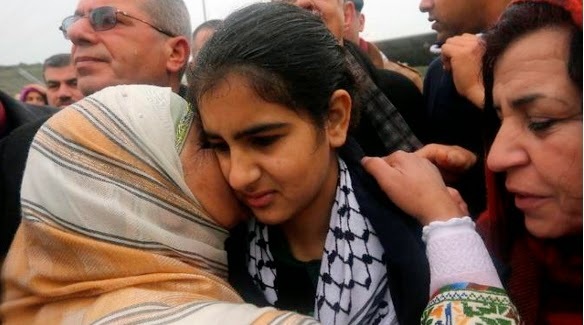 An AFP photographer in the West Bank town of Tulkarem said Malak al-Khatib was released there and greeted by her parents, relatives and the mayor, before being taken home to Beitin village, about 40 kilometres (25 miles) away. Malak was arrested on her way home from school on December 31, and a military court subsequently jailed her for two months. The Palestinian Prisoners' Club said two weeks had been deducted from the sentence due to her age. According to the indictment she had "picked up a stone" to throw at cars on a road used by Israeli settlers near the village and was also in possession of a knife for stabbing security personnel if she were arrested. Israel arrests about 1,000 children every year in the West Bank, often on charges of stone-throwing, according to rights group Defence for Children International Palestine. The arrest of Malak brought media organisations flocking to her family's door and attracted more public attention than most because she is a girl. The Prisoners' Club estimates that 200 Palestinian minors are held in Israeli prisons, but only four are girls, and Malak was the youngest. At the time, an Israeli military spokeswoman said Malak was convicted after a plea bargain. But her father said her confession counted for little. "A 14-year-old girl surrounded by Israeli soldiers will admit to anything," he said bitterly. "She would admit to holding a nuclear weapon if she were accused."